The other day I purchased a few thousand crystals in 3 different sizes in red, black, and clear, and 300 tiny silver nail studs for about $15 on Ebay. I was to do more editorial dramatic makeup looks for League of Space Pirates and other special things. 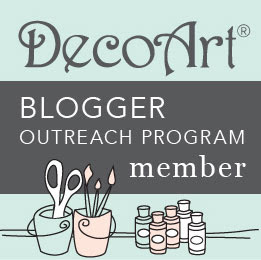 While I wait for them to arrive, I've been looking at inspiration photos and video tutorials. I'm hoping this collection of images and videos inspires you to add more glittery drama to your makeup. This style of makeup is high on fantasy. These inspiration photos range from the complicated to simpler. 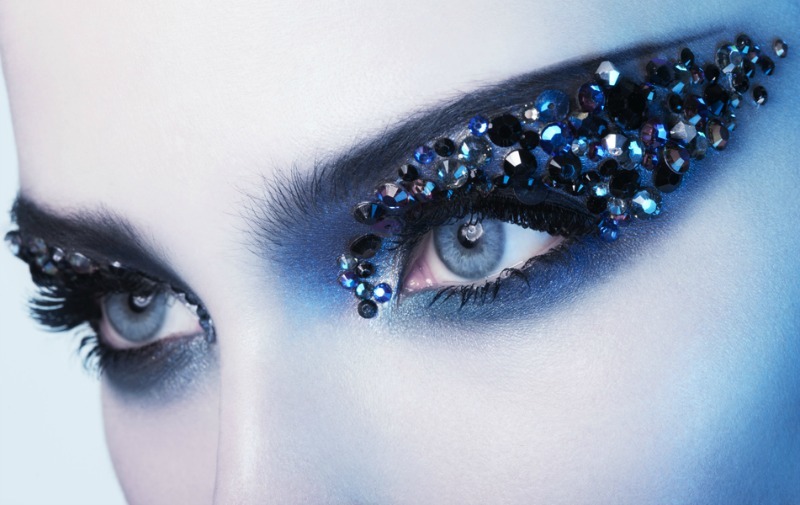 Pat McGrath used sequins, studs, and glitter to create this makeup look for Christian Dior's F/W 2011/2012 couture show. Monika Robl took this photo called Glittering Minds. Jangsara made this Leather-Studded Makeup using nail studs instead of crystals. Joy Du Jour created this swirled crystal and metallic makeup look. Linda Hallberg created this shimmery look. Pina C. created this makeup look called Queen of Blings. 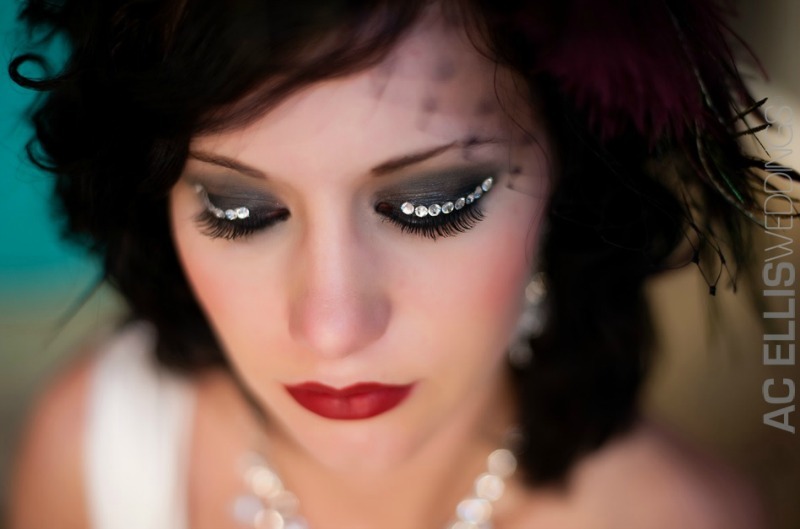 Platinum Imagination created and Cory Ann Ellis photographed this rhinestone wedding makeup. Andy Silvers took this photo of Kelly Eden wearing a rhinestone edges bottom liner. Though all of these jewels are attached with eyelash glue, if you want to learn about placement and how to do the other parts of the makeup, then you need to follow these tutorials. This is definitely advanced makeup, but if you are a novice, don't fear. 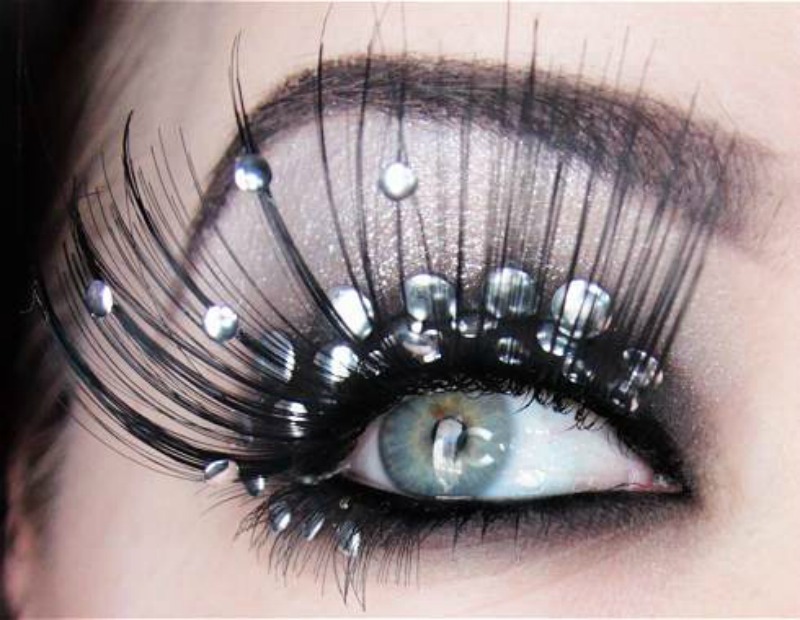 You can still try this out with a few rhinestones on the sides of your eyes, or a line of them along your upper eyelashes. Carly Musleh shows how to create these Cheryl Cole Studded Eyes. Beat Face Honey shows how to create this Valentine's Day Rhinestone Eye Makeup. Adia Braun created this Smokey Rhinestone Makeup by transforming a day time look into a night time look. The Korean pop group After School has a music video for their song "Flashback". Several of the ladies are wearing rhinestone and glittery eye makeup. 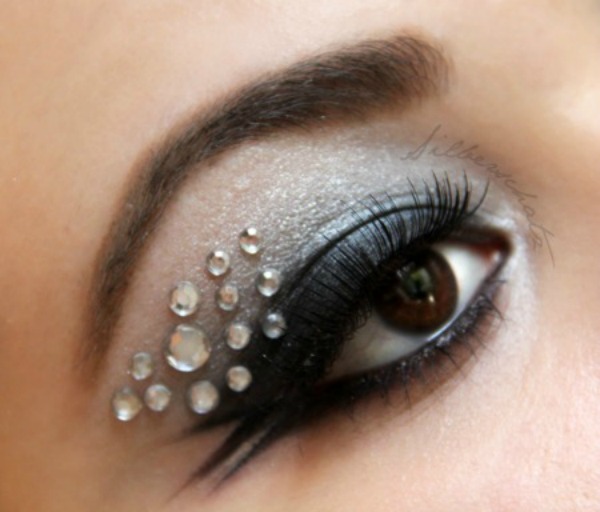 Kung Suay Jung created this tutorial for one of the Rhinestone Eye Makeup looks. Pixiwoo shows how to create a Crystal Eyeliner Makeup. Baby Star Angels show how to create a Sparkly Rhinestone Crystal Eye Makeup. Shiva Queen World shows how to create a Crystal-Eyesed Makeup. I've been wearing makeup for about 20 years now, but recently I've enjoyed wearing more challenging and dramatic makeup looks. Hopefully my fascination with this fantasy side of makeup, inspires you to try something new.